Do you want to hear about the next big thing in the automotive world? Well, you came to the right place. GMC trucks are the biggest, boldest, most luxurious, and most intelligent pickups on the market. Out of all the things that make them special, the balanced and passionate design will always gain the most positive attention. GMC trucks are not only muscular but also refined. At Carl Black in Kennesaw, we take pride in the innovative GMC trucks we get to provide the nation with on a daily basis. So, here are a few reasons why you should consider purchasing the next big thing – GMC trucks. The 2018 GMC Canyon is one of the most underestimated trucks on the market. The Canyon is extremely affordable at just over $20,000 and has the towing potential to haul 7,700 pounds. It may be categorized as a mid-size truck, but it has a mighty core that can’t be stopped. This is the ideal option for someone who wants a GMC truck with just enough style, intelligence, and power to get you through each day without a hassle and without hurting your wallet. The GMC Sierra 1500 is a legend among light-duty trucks, and its legacy has only grown with the refinements to the latest model. 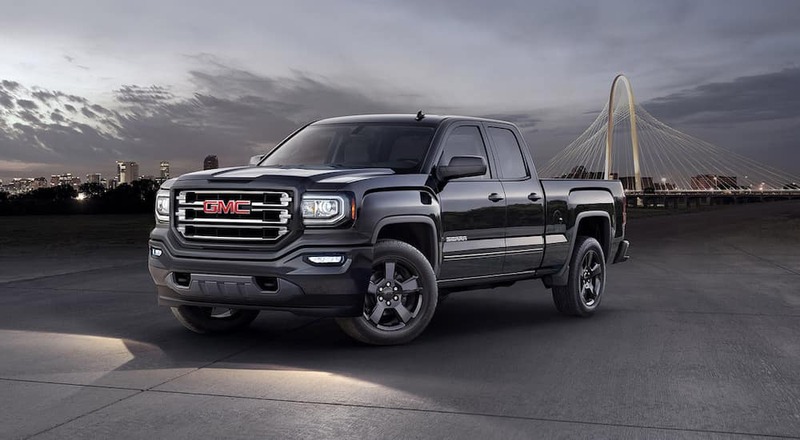 From towing potential that is beyond impressive at 12,500 pounds, to a cabin that will probably end up feeling more luxurious than your own living room with the best infotainment and high-grade features in the automotive world, the GMC Sierra 1500 is the truck that has it all. Nothing delivers power and luxury like a Sierra. The GMC Sierra 2500 is one of the two HD or heavy-duty models offered by GMC. With over 18,000 pounds of raw towing potential, the Sierra 2500 never fails to be a reliable ally with muscles that never seem to falter. This is one of the strongest trucks in the nation as well as one of the smartest and most luxurious. Additionally, just like every GMC truck, you will still get the option of with 2WD or 4WD. The GMC Sierra 3500 is the second and more powerful of the two HD or heavy-duty models offered by GMC. When it comes to GMC trucks or any trucks, in general, it doesn’t get much better than this. With 23,300 pounds of towing capacity and a massive measurement of 224-258″ L x 80-96″ W x 78″ H, this is one beastly beauty of a pickup. It pretty much shares everything with the Sierra 2500 besides the towing capability, dual rear wheel option for trims levels, and size. Trucks are some of the most powerful and efficient vehicles on the market today. Whether it’s helping a loved one move or going on the next big adventure in your life, a GMC truck will always be the best ally you could ask for. With the latest V6 and V8 engines to choose from and all the best off-roading technology, nothing will ever stand in your way once you are behind the wheel of a GMC truck. Trucks are no longer just muscular; they are also extremely intelligent. All GMC trucks offer only the top-of-the-line technology options such as their impressively brilliant infotainment system that connects directly to your smartphone to be used for a multitude of things. Make hands free calls and texts while listening to your playlist and even check maps every now and then as you take on the world from the roads. You will also gain access to only the best safety tech as well that was made not just to protect you from accidents, but prevent them altogether by increasing your awareness through censoring and alerting technology. There is no company or dealership in the world that is more passionate about trucks than GMC. You would never go to your primary care physician for a broken arm, why would you go to a car manufacturer for your truck needs? Just like that broken arm needs a specialist, so does your truck, and no one is more specialized in the manufacturing of trucks than GMC. We at Carl Black in Kennesaw find ourselves to always be transparent and customer-centric. We are just as passionate about our trucks as we are about forming a connection with every customer and hopefully gaining your trust and loyalty in the process. We believe that transparency is key and that with open and honest information and feedback we can find a way to help each other gain the satisfaction we require.